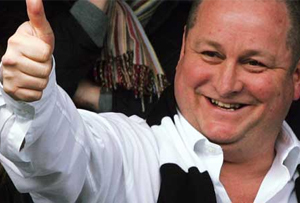 The billionaire Newcastle United owner cuts his stake in Sports Direct to 55%. What could he be up to? For such a private man, Mike Ashley certainly likes to court attention. We're only three weeks into this year and already he's got into a desperate scrap for control of Rangers football club and brought one of his companies from the brink of administration (USC) by getting another of his companies (Republic) to buy it. Last night, it emerged that the billionaire is selling 15.4 million shares (a 2.7% stake) in Sports Direct to institutional investors, with the help of everybody's best friend Goldman Sachs. On yesterday's closing prices, the deal would have been worth £117m, although this morning shares in Sports Direct have fallen 4.3% to 727p. This fall is unsurprising. Last time cut his stake in April 2014, by 4%, shares in the firm plummeted 10%. Some of these drops must be a result of the sudden glut of Sports Direct shares for sale, but some must reflect investor confidence - they want Ashley to stay. As a result of the sale, the man who founded Sports Direct in 1982 now owns 55% of the firm. Although he is technically its deputy chairman, this still leaves him very much in control. Clearly, Ashley wants the money for something, but what could it be? Whether he's a fan or just likes the football business, Ashley has made a habit of putting his money in football clubs. He's owned Newcastle since 2007, and bought a stake in Rangers in 2012. With a finger in the English and Scottish pies, the natural next choice would be a Welsh team. Given the value of the Welsh leagues, Ashley could probably take his pick and still have £115m left over. Aberystwyth Town, anybody? It worked last time. Back in January 2014, Ashley bought a 4.6% stake in Debenhams and sold it again four days later for a cool £5m profit. He immediately took out a put option, betting on the share price going up (it hasn't), then in October bought another 4.6% stake again. Ashley also took a gamble on Tescos shares last year, which given the mess at Britain's largest supermarket, almost certainly hasn't paid off. But that's no reason to give up on grocers. Morrisons shares have fallen 23% over the last 12 months and are currently trading at 192p - surely they're due for a bounce back? The reason Sports Direct invested in Debenhams (and, admittedly, Ashley did most of the above deals through Sports Direct, rather than as a private individual) was arguably to help convince the department store to open Sports Direct concessions in some of its shops. Given his penchant for dealing with struggling firms, Mulberry might be an ideal new partner. The firm suffered a 17% revenue decline last year, and who knows, chic handbags and discount sports brands could be the next big fashion pairing.